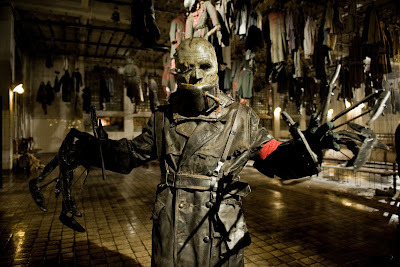 Dark Sky Films, Frankenstein's Army takes place toward the end of World War II, Russian soldiers pushing into eastern Germany stumble across a secret Nazi lab, one that has unearthed and begun experimenting with the journal of one Dr. Victor Frankenstein. The scientists have used the legendary Frankenstein's work to assemble an army of super-soldiers stitched together from the body parts of their fallen comrades -- a desperate Hitler's last ghastly ploy to escape defeat. On Saturday, January 26th, MPI/Dark Sky Film’s Frankenstein’s Army will have its World Premiere in director Richard Raaphorst’s homeland at the Rotterdam International Film Festival. To celebrate the world premiere, Dark Sky has released two new stills from the World War II horror/fantasy. Frankenstein's Army stars Karel Roden (Hellboy), Alexander Mercury (The Golden Compass), Joshua Sasse (The Big I Am), Luke Newberry (The Heart of Me), Andrei Zayats (X-Men: First Class), Mark Stevenson (The Last Horror Movie), Hon Ping Tang (The Fifth Element), Cristina Catalina (Eastern Promises), Robert Gwylim (Escape from Sobibor), and Jan De Lukovicz.